Phenomenological approaches to the social world are related to, but distinct from, phenomenology as a philosophical method. The latter involves the systematic investigation of consciousness. The key idea in phenomenological sociology is that people are conscious beings. This acknowledgement affects the way we need to explore the social world. If we accept that people are conscious and purposive social actors it is not logical to treat them in the same way as scientists would treat the inanimate and 'unconscious' objects of their studies. The work of Edmund Husserl was particularly important to the development of phenomenological philosophy (Figure 2.3.1:1). He was keen to demonstrate the falsity of the assumed separation of scientific knowledge from people's everyday experiences and actions. His main early texts (both in two volumes) are Logical Investigations (Husserl, 1901) and Ideas (Husserl, 1913, 1915). Husserl's philosophy is complex and multifaceted but a major element of his work was the idea that to interpret the meaning of a social phenomenon it is necessary to remove the layers of preconceptions that distort its essential meaning. This approach is known as transcendental phenomenology because it is necessary to transcend scientific explanations, prejudices, taken-for-granteds and 'common sense'. All of these conceal the 'essence' of a social phenomenon. Husserl argued for a process of 'bracketing' away prior conceptions (sometimes also referred to as 'reduction' or 'époché'). By 'bracketing' Husserl meant setting to one side explanations based on specific ways of seeing the world. Husserl's first level of 'bracketing' was to set aside natural or positivistic scientific explanations. That is, to see a social phenomenon devoid of any so-called scientific explanation of its significance. The second level of 'bracketing' (or double reduction or double époché) is to set aside all one's own prejudgements, common-sense or taken-for-granteds. Only then will you reach the essence of the social phenomenon. An example of transcendental phenomenological thinking might be to examine the presumed link between 'intelligence' and 'ethnicity'. The first level of bracketing would be to strip away the so-called scientific ways of measuring intelligence, notably intelligence tests (not least because of the culturally-specific nature of the IQ instrument) and disregard any outcomes based on such operationalisations of the concept. Then, at a second level of bracketing, reconceptualise what it is that constitutes intelligence in any socio-cultural or geographic setting. That is, strip away the taken-for-granteds of what we presume intelligence is. Do we label people intelligent because they think the same way we do? In the middle of the Australian outback, would quick reflexes and an understanding of local plant and animal life indicate a much higher level of intelligence than the ability to engage in philosophical debate or exhibit knowledge of Western politics? Is intelligence accumulated experience and knowledge, the ability to analyse, synthesise, critique or is it about being able to think rapidly? Is intelligence culturally specific? Do different ethnic groups then engage intelligence on different cultural grounds? In short transcendental phenomenology involves a layered approach to deconstructing 'scientific' concepts, which it sees as artificial constructs. In the process of deconstructing one eventually identifies the essence of the issue. Craib (1992) has also pointed out that the sociological form of phenomenology omits experiences such as emotions, imagination and hallucination that were of interest to Husserl. However, this is not strictly true since feminist sociologists have pointed to the ways in which the language of science has excluded emotions as a topic for study (see for example Harding, 1991). Since human beings do not separate thought from feeling in their everyday activities, then a science of society that ignores the role of emotions excludes a significant aspect of social processes. Although phenomenological social science takes a variety of forms, we can identify two main strands, interpretive sociology and interactionism (Figure 2.3.1:1). The interpretive approach draws on the work of Max Weber (1947, 1963, 1969) and usually takes a wide social or historical view (this also referred to as Weberian or Verstehen sociology). It was subsequently developed by Alfred Schutz (social action) who was a pupil of Husserl. The interactionist approach, which focuses on social interaction, particularly face-to-face or small group interaction, draws on the work of Simmel and Mead (Interactionism), which was developed by Blumer into symbolic interactionism and by others into reflexive sociology. Building on the insights of symbolic interactionism, Garfinkel, (1967) developed ethnomethodology, which in turn gave rise to conversational analysis and informed the development of aspects of postmodernism (Figure 2.3.1:1). 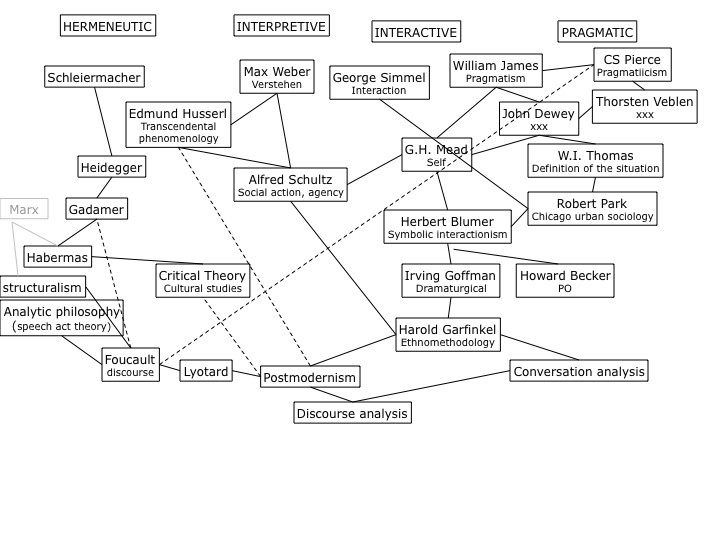 Another approach to interactionism, drawing from pragmatism, notably Dewey, was the work of the Chicago School (especially in its early days) and is found in the work of Thomas, Park, Burgess and their doctoral students. There are lots of cross-overs in the development of the different forms of interactionism and the the mapping of different approaches is complex. While this may be too scpecialised for some readers, the one thing to bear in mind is that there is no single approach to interactionism nor is there a simple geneaology from Mead to Blumer to Becker as is is often portrayed.